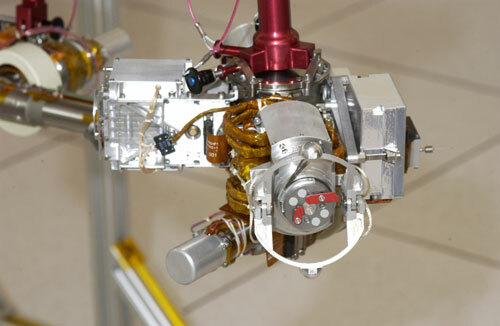 The Rock Abrasion Tool on the Mars Exploration Rovers, Spirit and Opportunity, is known as the RAT. The RAT's rotating, grinding teeth gnaw into the surface of Martian rock to reveal fresh mineral surfaces for analysis by the rover's scientific tools. MAIN JOB:To use a grinding wheel to remove dust and weathered rock, exposing fresh rock underneath. SIZE OF EXPOSED AREA:Able to create a hole ~2 inches (45 millimeters) in diameter and 0.2 inch (5 millimeters) deep into a rock on the Martian surface. GRINDING SPEED:The RAT is able to grind through hard volcanic rock in about two hours. The Rock Abrasion Tool is a powerful grinder, able to create a hole 45 millimeters (about 2 inches) in diameter and 5 millimeters (0.2 inches) deep into a rock on the Martian surface. 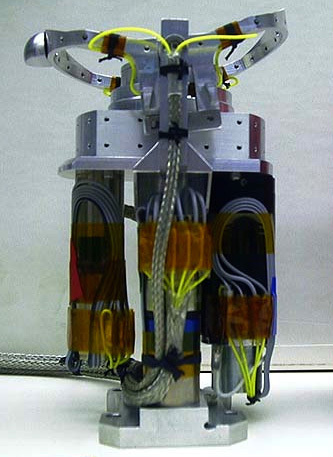 The RAT is located on the arm of the rover and weighs less than 720 grams (about 1.6 lbs). It uses three electric motors to drive rotating grinding teeth into the surface of a rock. Two grinding wheels rotate at high speeds. These wheels also rotate around each other at a much slower speed so that the two grinding wheels sweep the entire cutting area. The RAT is able to grind through hard volcanic rock in about two hours. Once a fresh surface is exposed, scientists can examine the abraded area in detail using the rover's other science instruments. This means that the interior of a rock may be very different from its exterior. That difference is important to scientists as it may reveal how the rock was formed and the environmental conditions in which it was altered. A rock sitting on the surface of Mars may become covered with dust and will weather, or change in chemical composition from contact with the atmosphere.